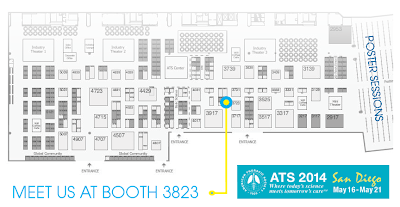 SCIREQ Inc.: Come by and see us at ATS 2014! We are heading back to San Diego to attend the American Thoracic Society International Conference from May 18-20 and also host a Breakfast Symposium on Monday May 19! We will be at booth 3823 in the main convention center hall. Come by and see a live demonstration of our equipment! We will be showing the flexiVent, our integrated platform which combines a mechanical ventilator with detailed measurements of respiratory mechanics, along with both our Multi-Subject extension (MSX) and Negative Pressure Forced Expirations (NPFE) extension. We will also have demonstrations of our inExpose, a compact, cost-efficient bench-top inhalation exposure system. Our team of experts will be there to discuss how we can work together to optimize your research and answer any questions you may have. Come by our poster on Tuesday to see our Senior Scientist, Dr. Annette Robichaud, present her latest findings. Session Info: Thematic Poster Session, [C62] MUSCLE SPASM AND COUGH: GOT THE NERVE? Come and meet us on Monday May 19 at 7am for a discussion on experimental details, their impact on lung function measurements and how they can be accounted for to conduct reproducible research. Session topic: Details Matter. How Reproducible is your Research? Space is limited. Click here for details and to register today!